WWW, June 2011 - The long wait is over: widely anticipated throughout the online Dub community, here is the third chapter of the phenomenal Italian Dub Community Showcase serial. Fifteen titles, thirty tracks, and once again the selection is stronger than strong. Consciousness and Dubwise galore, this is definitely a very precious gift from the Italian DUB Community to the World Wide DUB Massive. Respect is more than due! A precious gift it is, indeed. There is no reason for anyone to consider the fact that this free Net Album was released under Creative Commons Copyright to be a sign of a low quality contents. This is a sign of life from a very vibefull Italian DUB Community which cannot be refused or even denied. The fifteen different names range from the more well known names in Dub land like the Alambic Conspiracy, Dub Engine and Wicked Dub Division to artists like Cultural Sound System of whom not so much material is released via the Net Label channels. A Serious selection fe true, we're speaking about stricktly High Quality Low Bass Roots Reggae, showcase style. Even though this is extremely difficult to choose, nevertheless, two highlights. Another hard hitting Steppers which stands out is "Hunger/Hunger Dub" by Dub Shiloh. The track starts of with sounds, after which the up-tempo drum and bass line pop in the mix. The first mix might be kind of crucial, the second mix (officially entitled Hunger Dub) really is. This one will keep you jumping all the while, especially with some better speakers. 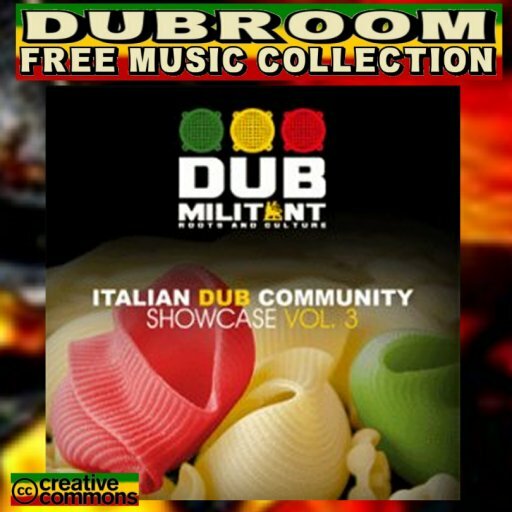 All in all, Italian DUB Community Showcase 3 was more than worth the wait, the anticipations were not in vain. There's unity and cooperation in this community, no partiality and no competition. This is a serious selection of some heavy-duty, heavyweight Euro Dub and Roots you just cannot refuse! This album was released under CreativeCommons Copyright, which means you can share it provided that the original zipfile is being offered without any change. Another aspect of the CC copyright is, that no money should be made and therefor this album is offered to you free of charge. For more specific information, look to the information in the archive. When you like the music, consider visiting the Net Label's website and donate some money or feedback. Do u have the complete tracklist of the album? There's a Vocal album and a Dub album. So the next 15 titles all come in two parts. all three compilations are really great and recommended for dl! highly appreciate your works as well, messian dread! The Dubroom welcomes your comments and stimulates exchange of ideas and opinions, but will refuse personal attacks, spam and off-topic material. Welcome to the Dubroom Reviews Weblog, where you can find reviews of the best (DUB) Reggae Music available online. We review albums, (freely) downloadable files, DVD's, online video's and more since 1997. The Dubroom covers a large number of topics, that may not alltogether be of interest to all visitors and readers of the Dubroom website and/or weblogs. That is why we have several weblogs, each one having their own specific field of coverage. Dubroom Online This is the main weblog, where all new articles and reviews are posted together with columns and more from the Webmaster, (DUB) Reggae news and views as well as news concerning the Dubroom and the rest. Ifficial Blog of Messian Dread The latest articles, updates, meditations, musical works and more from the Dubroom Webmaster. Babylon Observer The latest Babylon Observer publications is posted along with interesting news items from other websites. Center for Research on Christianity News and views from the religious system we know as "Christianity", CRC items will be posted along with interesting news item from other websites. Our NETLABEL releases music from the Dubroom Studio and that of others and our WEBSTORE has some interesting releases too. We also have tons of REVIEWS on MP3's, VIDEO's, ALBUMS, BOOKS, WEBSITES, and MORE. Especially for the (online) artists, there is an artists-only STUDIO. Additionally, we have several research and information websites on BABYLON, CHRISTIANITY, and RASTAFARI. Also check out our ARTICLES and get in touch with other visitors on our MESSAGE BOARD. Or stay up-to-date by subscribing to one or more of our MAILING LISTS. Find all Dubroom features at our SITE MAP. When something is unclear, you can always check our FAQ or use the search engine to find what you're looking for. And ofcourse, you can allways CONTACT us. All Music copyirght by the artists. All reviews copyright Dubroom. Awesome Inc. theme. Theme images by Ollustrator. Powered by Blogger.